It’s Christmas Eve here in the U.S. and tonight there will be thousands of children keeping a close eye on the skies for a jolly man and his flying reindeer. Now while there are some engineers out there who have their doubts about the physics of ‘ol St. Nick, it is a well documented fact that some of those twinkling lights aren’t meteors or levitating caribou, but satellites that help SkyTruth know who’s being naughty or nice. Unfortunately, our naughty list is usually longer than the nice list as we spot spills from oil tankers and gold mines, and watch landscapes being transformed by mining and fracking. So we need your help to keep on top of all the environmental changes happening place around the world. Will you consider making a tax-deductible donation to support our work in 2015? 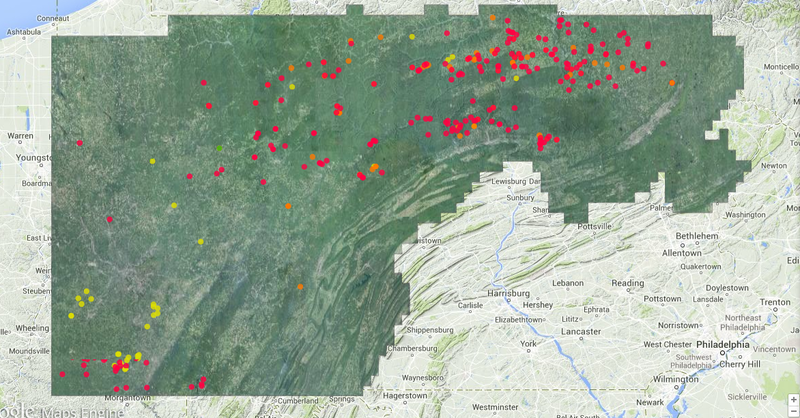 Gas flares from oil wells in North Dakota’s Bakken Shale. This map displays impoundments related to shale gas drilling and hydraulic fracturing (fracking) in Pennsylvania, as identified by SkyTruth staff and volunteers on USDA aerial survey photography from 2005, 2008, 2010 and 2013. 1. 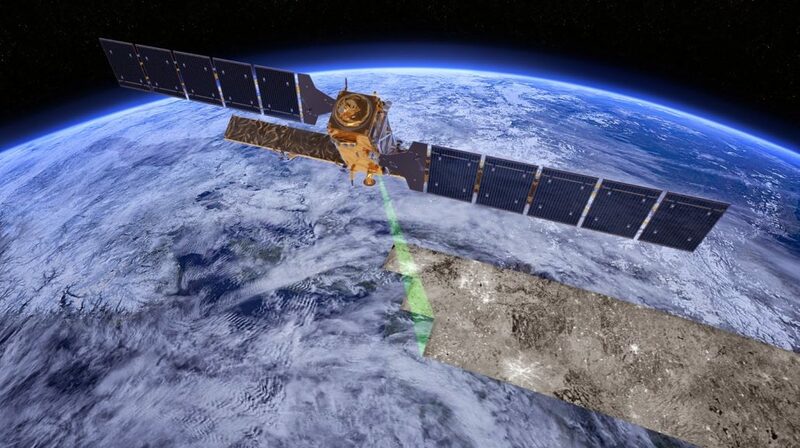 Spills, Spills, and Potential Spills: Satellites offer a unique vantage point for monitoring spills and pollution, so we continue to report on all of the spills and incidents that come to our attention. 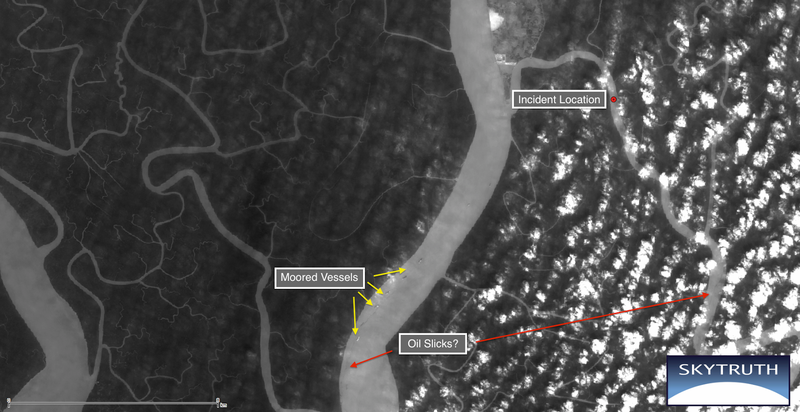 We’ve been busy throughout 2014 tracking disasters such as a massive sludge spill from a gold mine in Canada, oil tankers and oil-laden cargo ships wandering aimlessly around the ocean, and right now, a catastrophic spill in the world’s largest mangrove forest (see above). It looks like there will be some big decisions in 2015 on Arctic oil drilling and the Keystone XL pipeline, but we are also working to get ahead of pollution and environmental damage. With your help we can promote responsible fishing and protect special places from mining, drilling and spilling before it’s too late. Will you help us? 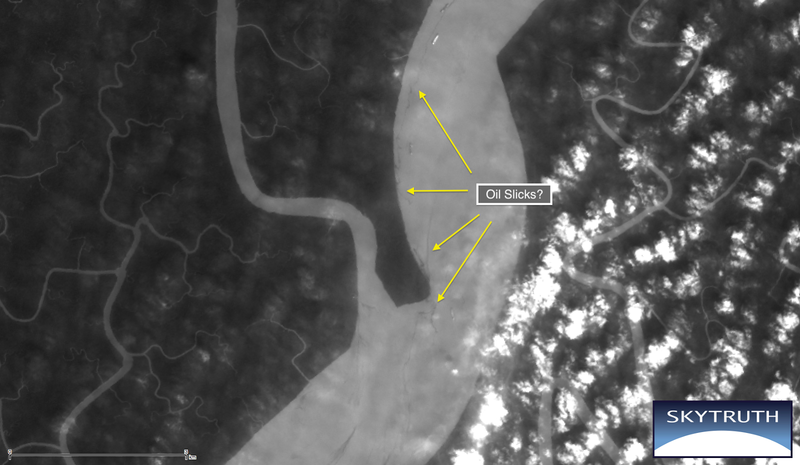 Updated Dec 16, 2014 at 6:00 PM with new information on the location of the Southern Star 7, as well as new and updated satellite images. Posted Dec. 15, 2014 at 11:00 PM: On the morning of Dec. 9, 2014, a tanker carrying heavy furnace oil to a powerplant in Bangladesh was struck in the fog by a cargo vessel and partially sank, releasing thousands of gallons of oil into the Sundarbans, the world’s largest continuous mangrove forest and a UNESCO World Heritage Site. This tidal river delta, already threatened by climate change, is home to incredible biodiversity including rare Irrawaddy and Ganges dolphins and what is believed to be one of the largest populations of the very endangered Bengal Tiger. Details, including the exact location* of the incident, remain vague, even though nearly a week has passed since the accident. The Times of India reports that while the accident occurred in a commonly travelled shipping lane, the collision occurred within one of the Sundarban’s three dolphin reserves. *SkyTruth has now received the coordinates of the incident from representatives on the ground. See below. 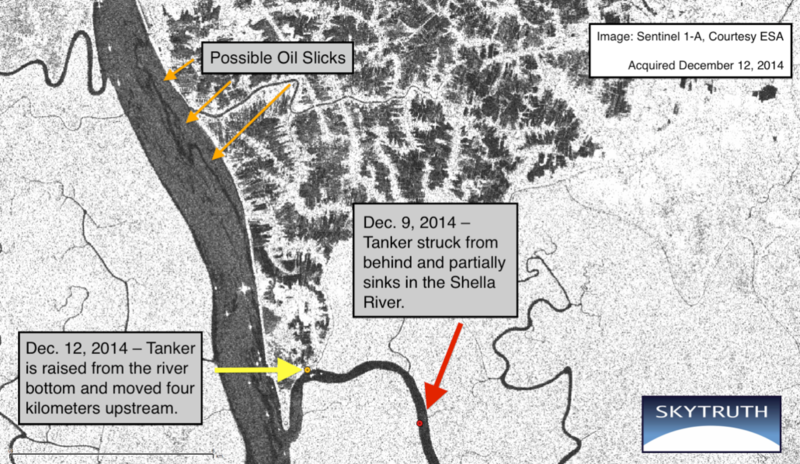 The “Southern Star 7” was carrying somewhere between 66,000 and 92,000 gallons (250,000-350,000) of furnace oil, but how much was actually spilled into the river remains unknown. 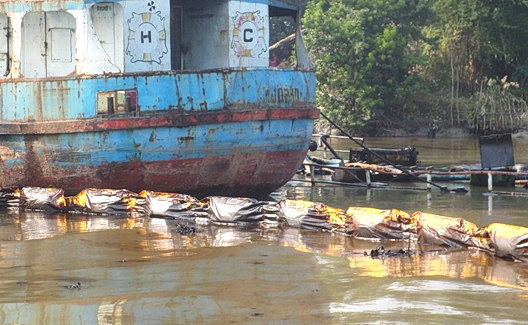 Residents have been seen collecting the oil by hand and with buckets to sell for a small reward to the state run Padma Oil company, while fishermen attempt to use their nets to contain the spill. Regional officials just announced they are hiring 100 boats and 200 workers to expand the clean-up effort. These tedious and messy clean up methods are a stark reminder that even after the BP disaster in the Gulf of Mexico in 2010, the Exxon Valdez spill off Alaska in 1989, the Ixtoc 1 spill in the Gulf of Mexico in 1979, and even the Santa Barbara Oil Spill off California all the way back in 1969, we haven’t really made any major improvements in how we clean up spilled oil. 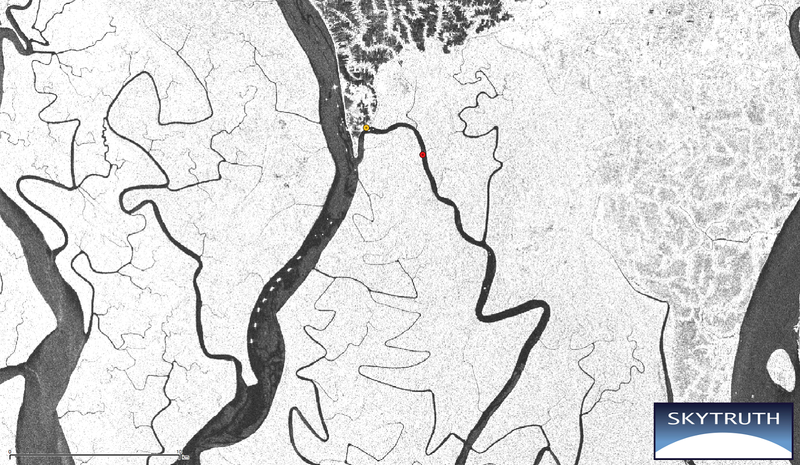 SkyTruth has been monitoring satellite images of Sundarbans National Park, and we believe we can see evidence of the oil on imagery from the European Space Agency’s new radar satellite: Sentinel 1 – A. According to sources on the ground, the Southern Star 7 sank into the river at 22°21’14.33″ N, 89°40’17.66″ E, about four kilometers from the confluence with the Passhur River. 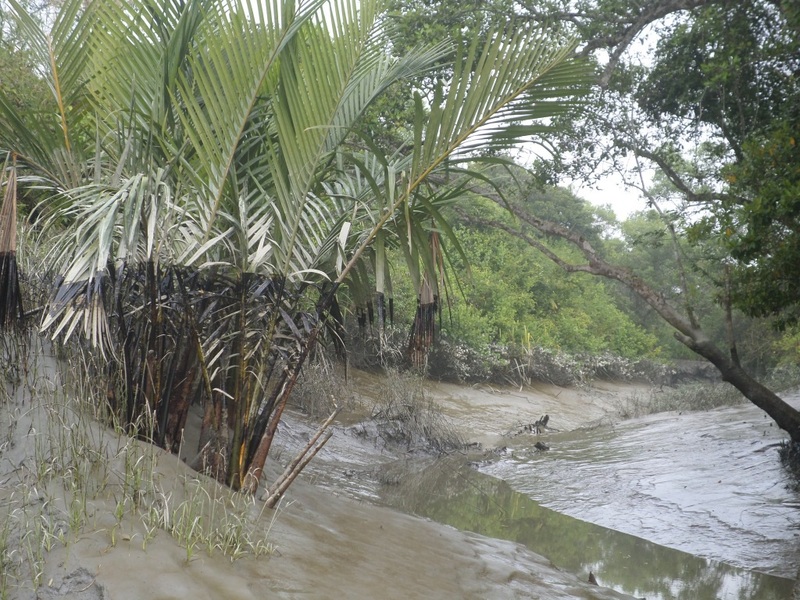 On December 12th it was lifted from the river floor and moved up to the riverbank to 22°22’1.44″ N, 89°38’30.91″ E.Because this region is a tidal river delta, water sloshes in and out of the mangrove forest twice a day. There are reports that the oil is continuing to spread up and down the river, and throughout the canals and channels that crisscross the region. On radar satellite imagery, we have observed what appears to be ropy strands of oil along 30 miles of the Passur River. To download these images for yourself, visit EarthExplorer for the latest Landsat, and create an account at the Sentinel Scientific Data Hub.